Congratulations to these guys on being our Feburary member of the month couple. Rita and Paolo haven’t been with us very long but they have certainly made an impact. When they started I’m sure they wouldn’t mind us saying that they were not natural athletes. They were however very keen to learn, get better and they are both very coachable. These are the signs of great members. Fast forward 8 months and they are not only members of the month because of how amazing they are as athletes and how much they have grown and improved, but also how amazing they are as people and as a couple. They are couple goals and when better to give them member of the month than the month of love. Rita is often found dancing and laughing mid workout when she is meant to be training (my kind of girl) and Paolo is usually staying behind or getting in early and working on his weaknesses. Paolo couldn’t single skip at all when he came to us. Now he does double under in a wod. Rita has a T shirt that says “I Hate Running” but has recently joined our endurance class to get better. As a coach you cant ask for better members! We are very lucky that our lovely Italian couple found us. Anyway enough of me talking a bout them lets here from Rita and Paolo. R – Well, not too much, I’ve been doing Crossfit from about 7 months. M – What class time do you normally attend and why does that work for you? P – When I started I just wanted to be fitter but now I see that as a secondary aspect. I just like to hit the gym and do the wod, maybe staying a few minutes after that to practice some movements. I like to learn new things and I’m loving all the new things that I’m learning thanks to crossfit. It’s also a way to release some stress after work. I have plenty of goals for 2019! I’ve started the year focusing on DU’s and when I managed to do the first one I was really happy about it (almost happy as much as you Em, when you saw me doing it. Maybe that was the moment when I realized you are so proud of every single one of us at the gym and for you every PB and every new skill acquired is a great success). I reckon that I still have to work a lot about DU’s because I can link 5 of them…sometimes and if I’m lucky! Recently my first rope decided to break, was during a wod and one handle flew over for like 2 or 3 meters, close to the machines from hell, aka assault bikes, where I almost killed a couple of people (I think there were George and James L. if I remember correctly, sorry again guys). I’ve ordered a new rope so I’ll start to practice them again in a couple of days. Also, I’m on that phase where it’s “easy” to hit new PB’s and of course I want to improve all my liftings but I would like to focus more on technique, learn some gymnastic movement (I’ve started to do pull ups without a band recently and it has been something like 10/15 years last time I was able to do them). So far I’m enjoying all of this and I see it as a marathon and not a sprint…There is plenty of time to improve. R -My Why? Ehm, I’m not very confident with myself, but since I started Crossfit I feel better with myself, mentally and physically. Therefore because of my job (I’m a Senior Care waiting to be a Nurse in the UK) I want to keep fit and strong to help people that need assistance every day. I’ve never done Crossfit before, I always hated going to the gym, but at MSQD I found a perfect environment that encourages me to come almost every day, I enjoy the WOD (well maybe “enjoy” it’s not the perfect word to explain it but ok! ), I enjoy the spirit around the gym, the music, the people and also to be happy or better to say over the moon after a PB or just be happy to watch someone else achieving a PB. M – What advice would you give people who are unsure whether to try M Squared or not? P – Probably I’ll tell them how I started. I’ll tell them that the very first time I set foot in M squared was during a wod, with a lot of people doing pull ups and cleaning heavy bars (I think to remember people were doing cleans but maybe I’m wrong because at that time I didn’t even know the meaning of “clean” in a gym context). At that time I was scared too! Then I did my foundation class and again, around me, there was a lot of people jumping and doing crazy stuff with bars that, honestly, looked so heavy to me and yes…I was more scared than before But then, finally, I did my first class a couple of days after that and I still remember that was Neil Shearer’s MOTM wod (thanks Neil) and it has been absolutely bloody awful. I don’t know why but I came back for more, and the more I went the more I was loving it and I would like to do crossfit for a long time now. Then I’ll probably tell that people to watch something on youtube about crossfit but not those videos of people like Froning or Fraser or anyone at the top of the sport…something about normal people like us doing a wod or, even better, people trying to hit a PB, whit all the people shouting and trying, somehow, to pass their energy to whoever is attempting the PB. Also, I’ll tell them about the adaptive athletes! Those guys are such an inspiration and true heroes! R – Ehm, can I say if I can do it you can do it!!! You don’t need to get fit first, I’m not fit at all, but I’m trying to. Everyone gets nervous when starting something new, but you will find a family, not just a gym, the coaches are incredible, they are ready to push you to do your best, everyone give advises to do better and improve in every skill, and, I can say that the best thing in Crossfit is when you are the Last one in a Wod everyone is shouting at you to go hard, to push you to do more!!! 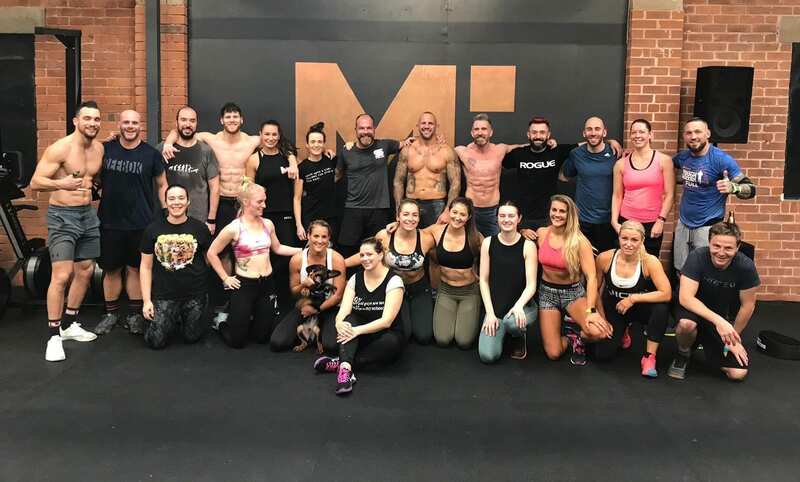 M – What’s your biggest achievement in CrossFit so far? P– I’m proud to be part of M squared and this is my best achievement! Being part of all this. I’m not the best athlete, I’m not the most sociable person, I’m bloody shy and I’m not even english! 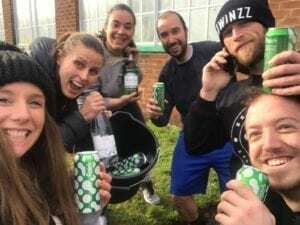 But I can say that I’m part of something nice, a great community with great people from whom I can learn a lot, not only about crossfit but also about how to be a better person and, maybe, I can help someone else too. R -Well, for me my best achievement it’s been a member of the month! That means a lot to me!! As Em saw I almost cried when she said: “You and Paolo are our members of the month!!”. 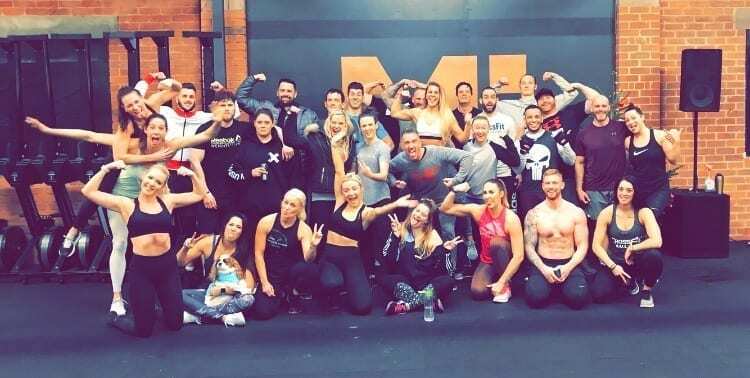 As I said I’ve always struggled to keep fit and find a gym/sport for me, but since when I started at MSQD I really enjoyed being part of the family! M – Thanks so much for your blog and being amazing people. We look forward to watching you progress even further and cant wait to see you both compete at the feMale mixed M Squared competition on Saturday 13th April.